As you might have noticed, I am gradually reposting all of my Holy Taco Church recipes here on Bready or Not. I knew I needed to move this cookie recipe forward in the queue when I was emailed by a woman who was dismayed the HTC website was gone and she needed this recipe again. 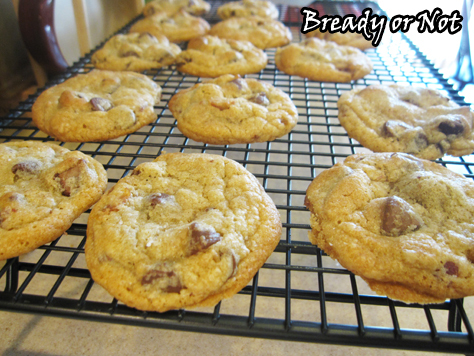 She described them as by far the best chocolate chip cookies she had ever made. There’s just something magical about the combination of bacon and chocolate. I’ve worked that alchemy in some other recipes like chocolate-covered bacon toffee (aka BACON CRACK). Here, the combo plays well together in cookie form. The addition of the bacon fat infuses dough with savory flavor. It’s amazing that the single tablespoon of fat makes such a huge difference. These are not cakey, soft cookies. They are crisp and chewy–more like the old Fanny Farmer recipe cookies my mom used to make me when I was a kid. Except with added bacon. Try this out. Maybe you’ll join the club that thinks these are the chocolate chip cookies of all time! Modified from the recipe at Something Swanky and originally posted at the Holy Taco Church. 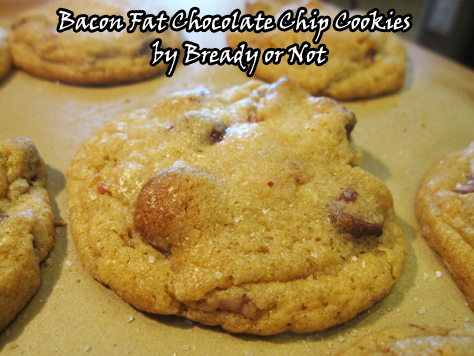 These chocolate chips cookies are infused with bacon fat AND bacon to grant them a complex salty-sweet-savory flavor and crisp, chewy texture. Makes 55-60 teaspoon-size cookies. Originally posted at Holy Taco Church. Modified from Something Swanky. Beat together the butter, bacon fat, brown sugar, and white sugar until creamy. Add the eggs one at a time, then the vanilla. Add the flour, salt, and baking soda to form the dough. 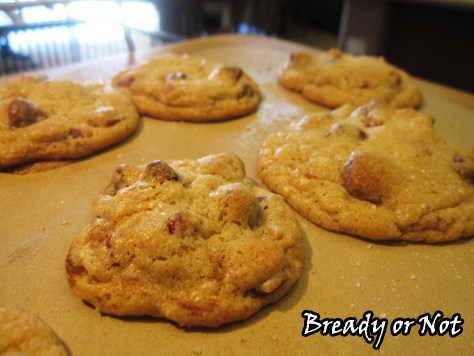 Gradually mix in the chocolate chips and then the bacon. Chill the dough for a minimum or two hours, covered with plastic wrap, up to a few days. Preheat oven to 375-degrees. Use a teaspoon scoop to dole out dough onto a pan and sprinkle a little extra sea salt over the tops to add some savory oomph. Bake for 10-12 minutes; let cool on cookie sheet for a few minutes, then transition to a rack. 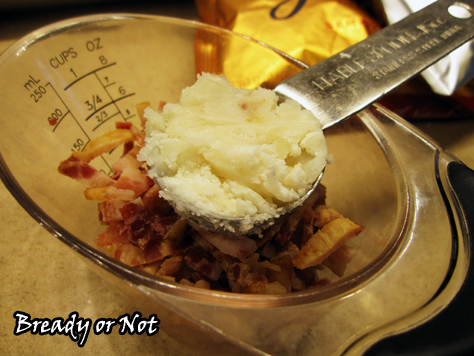 Recipe will make 55-60 teaspoon-size cookies. Years ago, my husband would fight his way into a local church sale to get CC cookies by one specific woman–the pastor to be exact. She finally gave him her secret. 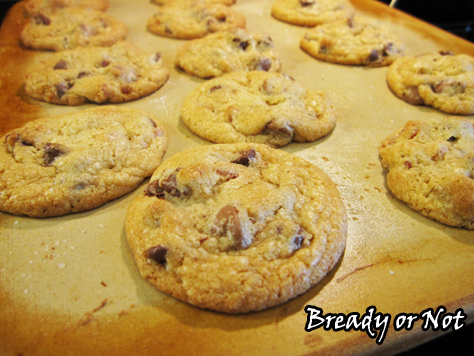 She used buttery flavored crisco and let the cookies finish cooking on the pan after taking them out of the oven. I think this might just top that long time favorite recipe of his.